Plumbtile always carries the best and most up to date products offered. California Faucets is no exception to that. California Faucets offers the finest quality faucets, trim and accessories featuring a complete line of coordinated lavatory faucets, tub sets, shower sets, bidets and bathroom accessories. There is a design that will fit everyone’s kitchen or bath. Plumbtile offers over 35 decorative finishes including: Chrome, Brass, Satin Nickel, Polished Nickel, Oil Rubbed Bronze. Plus, special finishes, including Antique Brass, Pewter, 24 Karat Gold, ten different PVD finishes, and more. We carry a wide selection of spout styles and handles. There is also flexibility to create your own unique combination by matching any component (i.e. handle, escutcheon, pop-up knob, etc., with any spout) in any finish combination. The goal we have at Plumbtile is to provide the most comprehensive collection of California Faucets products around. California Faucets are custom made and not mass produced. You can expect to have top notch quality with every piece. Starting with good old-fashioned craftsmanship featuring solid brass construction they add state-of-the-art ¼ turn ceramic disc valves with lifetime warranties. 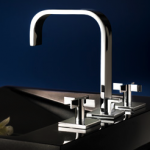 California Faucets offers the world’s largest selection of decorative PVD finishes and quality controls that meet or exceed government codes. It also meets national and local lead-free and water conservation standards. Some of the kitchen faucets Plumbtile carries is California Faucets Corsano, California Faucets Davoli, California Faucets Poetto and so many more. Each faucet has its own unique design elements. The Corsano collection features solid brass construction, high-arc 360 rotating spout which allows for easy filling of large pots and cleaning, a magnetic docking that secures the spray head into spout, a dual function aerated or spray mode with one button operation and many other features. Plumbtile carries many bathroom faucets such as California Faucets Aliso 72 Series, California Faucets Arpeggio, California Faucets Asilomar as well as many other collections. 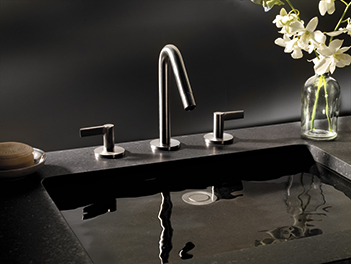 You will find a faucet that fits your bathroom and kitchen needs with the California Collection.